The final four players book their spot for the HCT Winter Championship Finals. 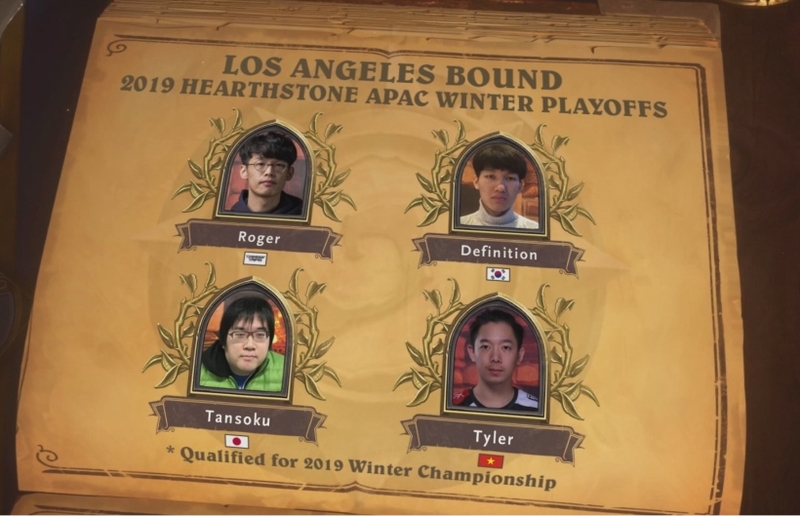 Four more players have qualified for Hearthstone's HCT Winter Finals, following this weekend's playoff stage for the Asia-Pacific region. Players Roger and Definition were the outright winners of Group A and B respectively, while Tansoku and Tyler also qualified by succeeding in the second-place decider matches within those groups. Roger enjoyed the strongest possible start in his Group A opening match against Tansoku, with a resounding 3-0 victory. His remaining qualifying match against Jinsoo was a tougher affair though, and went to 3-2. Tansoku bounced back in fine form to take the remaining Group A qualifying spot from Jinsoo in a 3-0 decider match-up. Both Definition and Tyler had strong starts in Group B with 3-1 victories over their opponents, but Definition was able to overcome Tyler in the Winners Match by three games to two. Tyler nevertheless secured his spot in the finals with another 3-1 win over Aojiru in the deciding match. As for the final stage of the HCT Winter Championship, all we know so far is that it will be held at Blizzard's bespoke Esports Arena in Los Angeles. Dates have yet to be confirmed, however, although we'll run a post on the homepage as soon as we know more.